American test pilot mission specialist astronaut 1998-2017. Status: Inactive; Active 1998-2017. Born: 1957-12-19. Spaceflights: 3 . Total time in space: 193.79 days. Birth Place: Sioux Falls, South Dakota. Grew up in McAllen, Texas. Educated Texas A&M; AFIT; Edwards. USAF test pilot. PERSONAL DATA: Born December 19, 1957, in Sioux Falls, South Dakota, and grew up in McAllen, Texas. Married to the former Melanie J. London. They have four children and one grandchild. He enjoys family activities, motorcycle riding and backpacking. Mike's main hobby is serving as Scoutmaster of a Boy Scout troop. His parents, Merlyn E. Fossum and Patricia A. Fossum, are deceased. SPECIAL HONORS: NASA Exceptional Service Medal and two NASA Spaceflight Medals. Scouting awards include Distinguished Eagle Scout, Silver Beaver and Vigil Member of the Order of the Arrow. Distinguished Military Graduate from Texas A&M University and Squadron Commander in the Corps of Cadets. Awarded the USAF Meritorious Service Medal with two Oak Leaf Clusters and various other service awards. Distinguished Graduate from the USAF Test Pilot School, Class 85A. EXPERIENCE: Fossum received his commission in the U.S. Air Force from Texas A&M University in May 1980. After completing his graduate work at the Air Force Institute of Technology in 1981, he was detailed to NASA-Johnson Space Center, where he supported Space Shuttle flight operations, beginning with STS-3. He was selected for Air Force Test Pilot School at Edwards Air Force Base, California, where he graduated in 1985. After graduation, Fossum served at Edwards AFB as a Flight Test Engineer in the F-16 Test Squadron, working on a variety of airframe, avionics and armament development programs. From 1989 to 1992, he served as a Flight Test Manager at Detachment 3, Air Force Flight Test Center. Fossum resigned from active duty in 1992 to work for NASA and retired as a Colonel from the USAF Reserves in 2010. He has logged more than 1,800 hours in 35 different aircraft. NASA EXPERIENCE: In January 1993, Fossum was employed by NASA as a Systems Engineer. His primary responsibilities were to evaluate the Russian Soyuz spacecraft for use as an emergency escape vehicle for the new space station. Later in 1993, Fossum was selected to represent the Flight Crew Operations Directorate in an extensive redesign of the International Space Station (ISS). After this, he continued work for the crew office and Mission Operations Directorate in the area of assembly operations. In 1996, Fossum supported the Astronaut Office as a Technical Assistant for Space Shuttle, supporting design and management reviews. In 1997, he served as a Flight Test Engineer on the X-38, a prototype crew escape vehicle for the ISS, which was under development in house by the Engineering Directorate at NASA-JSC and flight tested at NASA Dryden. Selected by NASA as an Astronaut Candidate in June 1998, he reported for training in August 1998. Astronaut Candidate Training included orientation briefings and tours, numerous scientific and technical briefings, intensive instruction in Shuttle and ISS systems, physiological training and ground school to prepare for T-38 flight training as well as water and wilderness survival training. Fossum previously served as the Astronaut Office Lead for ISS flight software development. As a Capsule Communicator (CAPCOM) in Mission Control, Fossum supported several flights, including Lead CAPCOM for ISS Expedition 6. A veteran of three space flights, STS-121 in 2006, STS-124 in 2008 and Expedition 28/29 in 2011, Fossum has logged more than 194 days in space, including more than 48 hours of Extravehicular Activity (EVA) in seven spacewalks. SPACE FLIGHT EXPERIENCE: STS-121 (July 4 to July 17, 2006), was a return-to-flight test mission and assembly flight to the ISS. During the 13-day flight, the crew of Space Shuttle Discovery tested new equipment and procedures that increase the safety of Space Shuttles and produced never-before-seen, high-resolution images of the Shuttle during and after its July 4th launch. The crew also performed maintenance on the ISS and delivered and transferred more than 28,000 pounds of supplies and equipment and a new Expedition 13 crewmember to the station. Fossum and Piers Sellers performed three EVAs to test the 50-ft robotic arm boom extension as a work platform. They removed and replaced a cable that provides power, command and data and video connections to the station's mobile transporter rail car. They also tested techniques for inspecting and repairing the reinforced carbon-carbon segments that protect the Shuttle's nose cone and leading edge of the wings. The STS-121 mission was accomplished in 202 orbits, traveling 5,293,923 miles in 12 days, 18 hours, 37 minutes and 54 seconds. STS-124 Discovery (May 31 to June 14, 2008) was the 123rd Space Shuttle flight and the 26th Shuttle flight to the ISS. STS 124 launched from Kennedy Space Center, Florida, and docked with the ISS on June 2, 2008, to deliver the Japanese Experiment Module-Pressurized Module (JEM-PM) and the Japanese Remote Manipulator System. STS-124 Shuttle astronauts delivered the 37-foot (11-meter) Kibo lab, added its rooftop storage room and Fossum accumulated 20 hours and 32 minutes of EVA in three spacewalks required to maintain the station and to prime the new Japanese module's robotic arm for work during 9 days docked at the orbiting laboratory. STS-124 also delivered a new station crewmember, Expedition 17 Flight Engineer Greg Chamitoff. He replaced Expedition 16 Flight Engineer Garrett Reisman, who returned to Earth with the STS 124 crew. The STS-124 mission was completed in 218 orbits, traveling 5,735,643 miles in 13 days, 18 hours, 13 minutes and 7 seconds. Fossum's third spaceflight began when he and Russian cosmonaut Sergei Volkov and Japanese astronaut Satoshi Furukawa launched to the ISS on June 7, 2011, from the Baikonur Cosmodrome in Kazakhstan. The trio arrived at the station on June 9. They spent 167 days in space and 165 days on the complex, during which NASA and its international partners celebrated the 11th anniversary of continuous residence and work aboard the station. Expedition 28 Commander Andrey Borisenko handed over station command duties to Fossum on September 14, 2011. Fossum's EVA during STS-135/ULF-7 brought him to seven EVAs in his career for a total of 48 hours, 32 minutes of EVA time, seventh on the all-time list for cumulative EVA time. Expedition 29 Commander Fossum, Flight Engineers Satoshi Furukawa of the Japan Aerospace Exploration Agency and Sergei Volkov of the Russian Federal Space Agency landed their Soyuz spacecraft in frigid conditions on the central steppe of Kazakhstan on November 21, 2011. Before leaving the station, Fossum handed over command to NASA Astronaut Dan Burbank. Expedition 28/29 was completed in 2,672 orbits, traveling 66,535,472 miles in 167 days. Born December 19, 1957 in Sioux Falls, South Dakota, and grew up in McAllen, Texas. Married to the former Melanie J. London. They have 4 children. He enjoys family activities, jogging, fishing, and backpacking. His mother, Patricia A. Fossum, resides in McAllen, Texas. His father, Merlyn E. Fossum, is deceased. McAllen High School, McAllen, Texas, 1976. B.S., Mechanical Engineering, Texas A&M University, 1980. M.S., Systems Engineering , Air Force Institute of Technology, 1981. M.S., Physical Science (Space Science), University of Houston-Clear Lake, 1997. Distinguished Military Graduate from Texas A&M University. Awarded the USAF Meritorious Service Medal with one Oak Leaf Cluster and various other service awards. Distinguished Graduate from the USAF Test Pilot School, Class 85A. Fossum received his commission in the US Air Force from Texas A&M University in May 1980. After completing his graduate work at the Air Force Institute of Technology in 1981, he was detailed to NASA-Johnson Space Center where he supported the development of Space Shuttle flight procedures. He was selected for Air Force Test Pilot School at Edwards Air Force Base, California, where he graduated in 1985. After graduation, Fossum served at Edwards AFB as a Flight Test Engineer in the F-16 Test Squadron, working on a variety of airframe, avionics, and armament development programs. From 1989 to 1992, he served as a Flight Test Manager at Detachment 3, Air Force Flight Test Center. Fossum resigned from active duty in 1992 in order to work for NASA. He has logged over 800 hours in 34 different aircraft. In January 1993, Fossum was employed by NASA as a systems engineer. His primary responsibilities were to evaluate the Russian Soyuz spacecraft for use as an emergency escape vehicle for the new space station. Later in 1993, Fossum was selected to represent the Flight Crew Operations Directorate in an extensive redesign of the International Space Station. After this, he continued work for the crew office and Mission Operations Directorate in the area of assembly operations. In 1996, Fossum supported the Astronaut Office as a Technical Assistant for Space Shuttle, supporting design and management reviews. 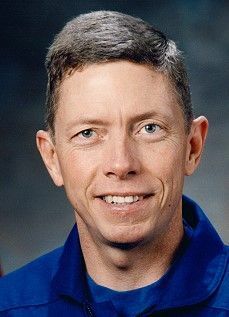 In 1997, he served as a Flight Test Engineer on the X-38, a prototype crew escape vehicle for the new Space Station, which is under development in-house by the Engineering Directorate at NASA-JSC and being flight tested at NASA-Dryden. Selected by NASA in June 1998, he reported for training in August 1998. Astronaut Candidate Training includes orientation briefings and tours, numerous scientific and technical briefings, intensive instruction in Shuttle and International Space Station systems, physiological training and ground school to prepare for T-38 flight training, as well as learning water and wilderness survival techniques. Following a period of training and evaluation, Fossum will receive technical assignments within the Astronaut Office before being assigned to a space flight. Family: Astronaut. Country: USA. Spacecraft: ISS. Flights: STS-121, STS-124, Soyuz TMA-20, Soyuz TMA-02M. Agency: USAF. Bibliography: 12, 5398. 1957 December 19 - . Birth of Michael Edward Fossum - . Nation: USA. Related Persons: Fossum. American test pilot mission specialist astronaut 1998-2017. 3 spaceflights, 193.8 days in space. Flew to orbit on STS-121 (2006), STS-124, Soyuz TMA-02M..
1985 July 19 - . NASA Astronaut Training Group 17 selected. - . Nation: USA. Related Persons: Anderson, Clayton, Archambault, Caldwell, Chamitoff, Creamer, Ferguson, Foreman, Fossum, Ham, Hilliard, Johnson, Gregory C, Johnson, Gregory H, Love, Melvin, Morgan, Nespoli, Oefelein, Olivas, Patrick, Poindexter, Pontes, Reisman, Swanson, Vittori. Mission Specialists: Bachelor's degree in engineering, biological science, physical science or mathematics and minimum three years of related experience or an advanced degree. Vision minimum 20/150 uncorrected, correctable to 20/20. Maximum sitting blood pressure of 140/90. Height between 150 and 193 cm.. Of 25 Americans, eight pilots and 17 mission specialists. 2006 February 3 - . 2006 July 4 - . 2006 July 4 - . 18:38 GMT - . Launch Site: Cape Canaveral. Launch Complex: Cape Canaveral LC39B. LV Family: Shuttle. Launch Vehicle: Space Shuttle. STS-121 - . Call Sign: Discovery. Crew: Fossum, Kelly, Mark, Lindsey, Nowak, Reiter, Sellers, Wilson. Return Crew: Fossum, Kelly, Mark, Lindsey, Nowak, Sellers, Wilson. Payload: Discovery F32 / Leonardo. Mass: 121,094 kg (266,966 lb). Nation: USA. Related Persons: Fossum, Kelly, Mark, Lindsey, Nowak, Reiter, Sellers, Wilson. Agency: NASA. Manufacturer: Boeing. Program: ISS. Class: Manned. Type: Manned spaceplane. Flight: Soyuz TMA-8, STS-121, STS-121 Astrolab. Spacecraft Bus: Shuttle. Spacecraft: Discovery. Duration: 12.78 days. Decay Date: 2006-07-17 . USAF Sat Cat: 29251 . COSPAR: 2006-028A. Apogee: 351 km (218 mi). Perigee: 332 km (206 mi). Inclination: 51.60 deg. Period: 91.40 min. The shuttle was launched using external tank ET-119 and solid motors RSRM-93. Cameras revealed that large chunks of foam were still shed from the external tank during the ascent to orbit. However examination of the heat shield using a new extension and sensors attached to the shuttle's robot arm revealed no significant damage. Discovery docked with the PMA-2 adapter on the Destiny module of the ISS at 14:52 GMT on 6 July. On July 7 the Leonardo cargo module was moved from the shuttle payload bay by the robot arm and docked to the Unity Module of the ISS between 09:42 and 11:50 GMT. The crew then began unloading the spare parts and supplies in the module to the station. A series of three EVAs conducted on 8 to 12 July tested the new equipment and techniques for repairing the shuttle heat shield in case of damage, and did some preliminary installations on the exterior of the ISS to pave the way for continued station assembly missions. On 14 July, the station's SSRMS robot moved the Leonardo module from the station back to the shuttle cargo bay between 13:08 and 14:50 GMT. The shuttle separated from the ISS, and fired its engines at 12:07 GMT on 17 July to make a 92 m/s deorbit maneuver. Discovery landed at the Kennedy Space Center at 13:14 GMT. European astronaut Reiter was left behind to make up part of the EO-13 resident crew on the station. 2006 July 5 - . 2006 July 6 - . 2006 July 7 - . 2006 July 8 - . STS-121 MCC Status Report #09 - . Nation: USA. Related Persons: Fossum, Kelly, Mark, Lindsey, Nowak, Reiter, Sellers, Vinogradov, Williams, Jeffrey, Wilson. Program: ISS. Flight: Soyuz TMA-8, STS-121, STS-121 Astrolab. 2006 July 8 - . 13:17 GMT - . EVA STS-121-1 - . Crew: Fossum, Sellers. EVA Duration: 0.31 days. Nation: USA. Related Persons: Fossum, Sellers. Program: ISS. Flight: STS-121. The astronauts tested the OBSS robot arm extension that would be available in later missions to carry an astronaut underneath the Shuttle for tile repairs..
2006 July 9 - . 2006 July 10 - . 2006 July 10 - . 07:14 GMT - . EVA STS-121-2 - . Crew: Fossum, Sellers. EVA Duration: 0.28 days. Nation: USA. Related Persons: Fossum, Sellers. Program: ISS. Flight: STS-121. The crew worked on the exterior of the ISS. They installed a spare pump module on the ESP-2 platform and replaced an umbilical cable assembly for the ISS Mobile Transporter, making it ready for installation of new solar truss panels on the next mission..
2006 July 11 - . 2006 July 12 - . 2006 July 12 - . 06:20 GMT - . EVA STS-121-3 - . Crew: Fossum, Sellers. EVA Duration: 0.30 days. Nation: USA. Related Persons: Fossum, Sellers. Program: ISS. Flight: STS-121. The crew tested repairing samples of heat shield material with DTO 848 protection system repair kit demonstator mounted in the shuttle payload bay..
2006 July 13 - . 2006 July 14 - . 2006 July 15 - . 2006 July 16 - . 2006 July 17 - . 2006 July 17 - . 13:14 GMT - . Landing of STS-121 - . Return Crew: Fossum, Kelly, Mark, Lindsey, Nowak, Sellers, Wilson. Nation: USA. Related Persons: Fossum, Kelly, Mark, Lindsey, Nowak, Sellers, Wilson. Program: ISS. Flight: STS-121. 2008 May 12 - . 2008 May 27 - . 2008 May 29 - . ISS On-Orbit Status 05/29/08 - . Nation: USA. Related Persons: Fossum, Garan, Ham, Kononenko, Reisman, Volkov, Sergey. Program: ISS. Flight: Soyuz TMA-12, STS-123 ISS EO-16, STS-124. 2008 May 30 - . 2008 May 31 - . 2008 May 31 - . 21:02 GMT - . Launch Site: Cape Canaveral. Launch Complex: Cape Canaveral LC39A. LV Family: Shuttle. Launch Vehicle: Space Shuttle. STS-124 - . Call Sign: Discovery. Crew: Chamitoff, Fossum, Garan, Ham, Hoshide, Kelly, Mark, Nyberg. Payload: Discovery F34 / Kibo PM / ISS-1J. Mass: 119,190 kg (262,760 lb). Nation: USA. Related Persons: Chamitoff, Fossum, Garan, Ham, Hoshide, Kelly, Mark, Nyberg. Agency: NASA. Program: ISS. Class: Manned. Type: Manned spaceplane. Flight: Soyuz TMA-12, STS-123 ISS EO-16, STS-124, STS-124 ISS EO-17. Spacecraft Bus: Shuttle. Spacecraft: Discovery. Duration: 13.76 days. Decay Date: 2008-06-14 . USAF Sat Cat: 32960 . COSPAR: 2008-027A. Apogee: 351 km (218 mi). Perigee: 338 km (210 mi). Inclination: 51.60 deg. Period: 91.40 min. Discovery delivered to the International Space Station the Kibo Pressurized Module, the primary element of the Japanese portion of the station. Half an earth away from jettison of external tank ET-128, a 76 m/s OMS-2 burn at 21:40 GMT put the Shuttle in its low-altitude chase lorbit. Discovery docked at the PMA-2 port of the station at 18:03 GMT on 2 June. Using the shuttle and station's robotic arms, with assistance from spacewalking astronauts, the Kibo module was attached to the station's Harmony module at 23:01 GMT on 4 June. The previously-delivered Japanese Logistics Module was transferred from Harmony to Kibo on 6 June at 20:04 GMT. The Shuttle undocked from the station on 11 June at GMT and landed on 14 June at 15:15 GMT at the Kennedy Space Center. 2008 June 1 - . 2008 June 2 - . 2008 June 3 - . EVA STS-124-1 - . Crew: Fossum, Garan. EVA Duration: 0.28 days. Nation: USA. Related Persons: Fossum, Garan. Program: ISS. Flight: Soyuz TMA-12, STS-124. Transferred the OBSS back to the shuttle. Prepared the Japanese Kibo module for installation. Replaced a bearing assembly on the failed starboard Solar Alpha Rotary Joint..
2008 June 4 - . 2008 June 5 - . EVA STS-124-2 - . Crew: Fossum, Garan. EVA Duration: 0.30 days. Nation: USA. Related Persons: Fossum, Garan. Program: ISS. Flight: Soyuz TMA-12, STS-124. Continued installation work on the Kibo module and began replacment of the starboard nitrogen tank assembly..
2008 June 6 - . 2008 June 7 - . 2008 June 8 - . EVA STS-124-3 - . Crew: Fossum, Garan. EVA Duration: 0.27 days. Nation: USA. Related Persons: Fossum, Garan. Program: ISS. Flight: Soyuz TMA-12, STS-124. Finished outfitting the Kibo module and nitrogen tank replacement..
2008 June 9 - . 2008 June 14 - . 15:15 GMT - . Landing of STS-124 - . Return Crew: Chamitoff, Fossum, Garan, Ham, Hoshide, Kelly, Mark, Nyberg. Nation: USA. Related Persons: Chamitoff, Fossum, Garan, Ham, Hoshide, Kelly, Mark, Nyberg. Program: ISS. Flight: STS-123 ISS EO-16, STS-124. 2010 December 15 - . 19:09 GMT - . Launch Site: Baikonur. Launch Complex: Baikonur LC1. LV Family: R-7. Launch Vehicle: Soyuz-FG. Soyuz TMA-20 - . Call Sign: Varyag. Crew: Coleman, Catherine, Kondratiyev, Nespoli. Backup Crew: Fossum, Furukawa, Ivanishin. Payload: Soyuz 7K-STMA s/n 230. Mass: 7,200 kg (15,800 lb). Nation: Russia. Agency: RKA. Program: ISS. Class: Manned. Type: Manned spacecraft. Flight: Soyuz TMA-20. Spacecraft Bus: Soyuz. Spacecraft: Soyuz TMA. Duration: 159.30 days. Decay Date: 2011-05-24 . USAF Sat Cat: 37254 . COSPAR: 2010-067A. Apogee: 355 km (220 mi). Perigee: 350 km (210 mi). Inclination: 51.60 deg. Period: 91.60 min. ISS EO-26 crew. Docked at the Rassvet module of the ISS at 20:11 GMT on 17 December. The crew boarded Soyuz TMA-20 and undocked at 21:35 GMT on 23 May 2011. They pulled back 200 m from the station, then took comprehensive photography of the station until 22:17 as it rotated before them. After departure from the visinity of the station, the Soyuz fired its engines at 01:36 GMT on 24 May to start the descent into the atmosphere. The orbital module and service modules separated from the descent module at 02:01 GMT. The crew landed safely in Kazakhstan at 02:27 GMT. 2011 June 7 - . 20:12 GMT - . Launch Site: Baikonur. Launch Complex: Baikonur LC1. LV Family: R-7. Launch Vehicle: Soyuz-FG. Soyuz TMA-02M - . Call Sign: Eridanus. Crew: Fossum, Furukawa, Volkov, Sergey. Backup Crew: Kononenko, Kuipers, Pettit. Payload: Soyuz TMA s/n 702. Mass: 7,200 kg (15,800 lb). Nation: Russia. Program: ISS. Class: Manned. Type: Manned spacecraft. Flight: Soyuz TMA-02M. Spacecraft Bus: Soyuz. Spacecraft: Soyuz TMA. Duration: 167.26 days. Decay Date: 2011-11-22 . USAF Sat Cat: 37633 . COSPAR: 2011-023A. Apogee: 403 km (250 mi). Perigee: 374 km (232 mi). Inclination: 51.60 deg. Period: 92.30 min. Carried the EO-28 crew to the station. Docked with the ISS at the Rassvet on 9 June at 21:18 GMT. Undocked from the same port on 21 November at 23:00 GMT, followed by landing of the crew in Kazakhstan at 02:26 GMT on 22 November..
2011 July 12 - . EVA STS-135-1 - . Crew: Fossum, Garan. EVA Duration: 0.27 days. Nation: USA. Program: ISS. Flight: Soyuz TMA-02M, Soyuz TMA-21, STS-135. Final EVA from a shuttle. The astronauts moved a failed pump module to the shuttle bay, and deployed several experiments on the outside of the ISS..